I started playing soccer when I was 10. I was not particularly good at it, still liked it since I scored a lot of goals. It is around this time in 1986 that I heard about Diego Maradona. He had won the quarter-final match for Argentina, against England. The next day, newspapers ran headlines "Hand of God wins the match for Argentina", "Maradona scores the Goal of the Century to win quarter-final" etc. I was curious to watch him play. In those days, there was no satellite TV in India and we did not have TV at home, so my wish remained unfulfilled. When "Italia 90" happened in 1990, my enthusiasm was at its peak, since I continued playing at an amateur level. We had a TV at home and I could watch all the matches. There was a galaxy of star players - Maradona, Roberto Baggio, Marco Van Basten, Ruud Gullit, Lothar Matthaus belonging to various countries in this world cup. My main attraction was Maradona. Match after match, I could see Maradona running with the ball tirelessly. He got pushed, shoved and tackled brutally by opposition players. He was constantly marked by 2-3 players whose only job was to ensure that Maradona did not get the ball. He would fall, scream in pain and get up, dribble past 2-3 players to extend a pass to Caniggia or other team-mates or take a shot directly at the nets. On the whole, it was a fascinating experience to watch him play. I remember renting VHS tapes in 1991, of all the World Cup matches held in 1986. I watched his 2 goals against England on repeat for a few days. The first goal was a mix of genius and luck. Maradona dribbled past 4 English players and passed the football to Valdano, which instead went to English defender Valdano. Valdano tried to deflect the ball but miscued it, so the football went towards the English goalkeeper Shilton, where Maradona was already waiting. 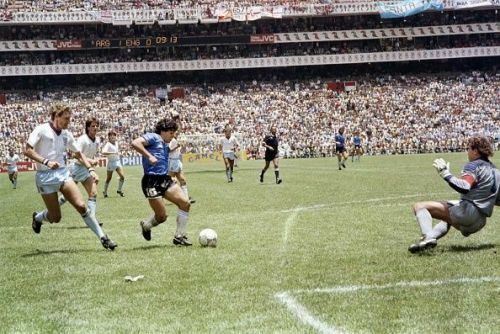 Before the goalkeeper could get hold of the football, Maradona jumped and used his left arm to score a goal. The replay clearly showed that Maradona had used his hand, but it was awarded after a lot of protests. The second goal was pure genius. Maradona received the ball at the half-way line. He ran with the ball some 60 yards, dribbling past 4 English players, went inside the box and scored the goal. About this goal, Gary Lineker said: "What can I say about Maradona, the man is a football genius. His solo effort against us was the one and only time in my whole career I felt like applauding the opposition scoring a goal. He showed some amazing individual skill." Diego was a warrior, a leader. He was a natural talent, with his golden left foot, his speed, and his dribbling skills. His short stature allowed him to manoeuvre effectively than most other football players. 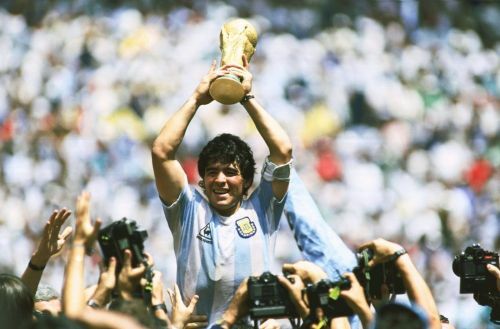 Maradona scored 34 goals in 91 international games and 312 goals in 588 matches at club level. He is often compared with Pele. Some regard Maradona as the best football player ever, while some regard Pele as the best player of all time. For me, he is a legend of the game. He gave me the joy which I do not derive from watching other star players - like Messi, Ronaldo, Pele and other greats. “Pele’s my idol but I saw Maradona play. There’s no question in my mind that he’s the number one. He might have had his faults but he’s shown on the pitch what real football is all about. My dream is to play with him one day, if only for a few minutes. I learned a lot just by watching him play.” - Roberto Carlos.